Even if Tracked Changes is currently turned off, there's a possibility that your document contains colored underlines and strikethrough, indicating insertions and deletions that were made as suggestions while Track Changes was turned on. The markings are visible to anyone who chooses All Markup or Simple Markup in the Tracking section of the Review tab. Remove the markings by accepting or rejecting the changes. Use the buttons in the Changes section of the Review tab. Previous and Next take you from one change to the next. Accept makes a change permanent. Reject gets rid of a change. 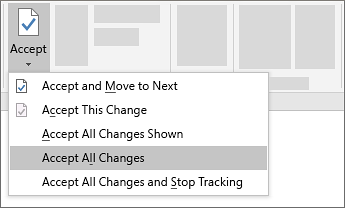 Tip: To accept or reject changes all at once, click the arrow on the Accept or Reject button, and then choose Accept All Changes or Reject All Changes.